Open access Late Quaternary horses in Eurasia in the face of climate and vegetation change, by Leonardi et al. Science Advances (2008) 4(7):eaar5589. 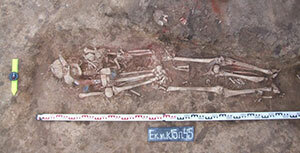 For most analyses, the data have been divided into climatic periods: pre-LGM(older than 27 ka B.P. ), LGM(27 to 18 ka B.P. ), Late Glacial (18 to 11.7 ka B.P. ), Preboreal (11.7 to 10.6 ka B.P. ), Boreal (10.6 to 9.1 ka B.P. ), Early Atlantic (9.1 to 7.5 ka B.P. ), Late Atlantic (7.5 to 5.5 ka B.P. ), and Recent (younger than 5.5 ka B.P.) (Fig. 1, A and B). The spatial and temporal distribution of horse remains compiled in our database reveals a strong imbalance in Eurasia (Fig. 1, A and B). We found a common trend in both regions for a high number of occurrences at the end of the Pleistocene (with a decrease during the LGM, only visible in Europe), followed by a drastic reduction in the Early and Middle Holocene, and a relative increase toward more recent times. These included both the Early Atlantic in Europe, which started ~9.1 ka B.P., and the time range after 5.5 ka B.P. for Asia. The horse fossil record appears ubiquitous throughout Europe in the Late Pleistocene, while in the Early and Middle Holocene the finds are concentrated in central-western Europe and Iberia. From 7.5 ka B.P., the number of finds increases markedly, and the geographical distribution extends toward the east and southeast. 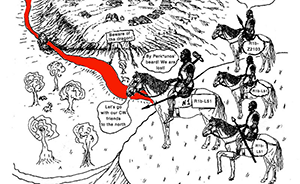 Horse occurrences through time. (A) Horse occurrences through time. Histograms showing the number of horse observations in Europe (left panel) and Asia (right panel) for each time bin (top) and for climatic period (bottom). Only time bins with more than 10 observations (black horizontal line) have been considered for the SDM analyses. From 22 ka B.P. backward (gray vertical line), time bins cover 2 ka following the available paleoclimatic reconstructions. 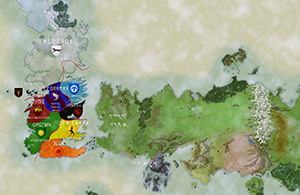 The central map shows the boundaries considered while defining European and Asian regions, with the black line representing the Urals. The zoomed area shows the geographical resolution of the climatic reconstructions, with each pixel representing a grid cell. (B) Geographic distribution of horse occurrences. Maps showing horse occurrences for each climatic period in Europe (left) and Asia (right). This analysis revealed that, in both continents, horses occupied only a portion of the climatic space available. The range covered by random locations shows that the paleoecological conditions present in Europe were only a subset of those found in Asia. However, European horses occupied a much wider climatic space than in Asia, with only limited overlap between the two ranges. There is no evidence of climatic barriers between those two populations through time because the forecasts from Europe and Asia always overlap in central Eurasia, except 5 ka B.P. (figs. S3 and S4). 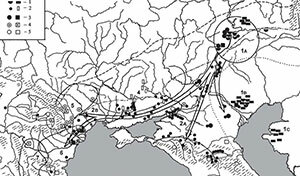 An alternative explanation is the role of the Urals as a potential constraint for the dispersal of horses between Europe and north central Asia. Climatic suitability. (A) Cumulative climatic suitability for the past 44 ka based on simulation on the European (left), Eurasian (middle), and Asian (right) data sets. To correct for sampling bias in the Eurasian data set, for each time slice, all estimates and projections for Eurasia are performed considering 100 random resampling of European occurrences in the same number as Asian occurrences. The darker the colors, themore stable the climatic suitability for horses (climatic niche = p-Hor) through time. 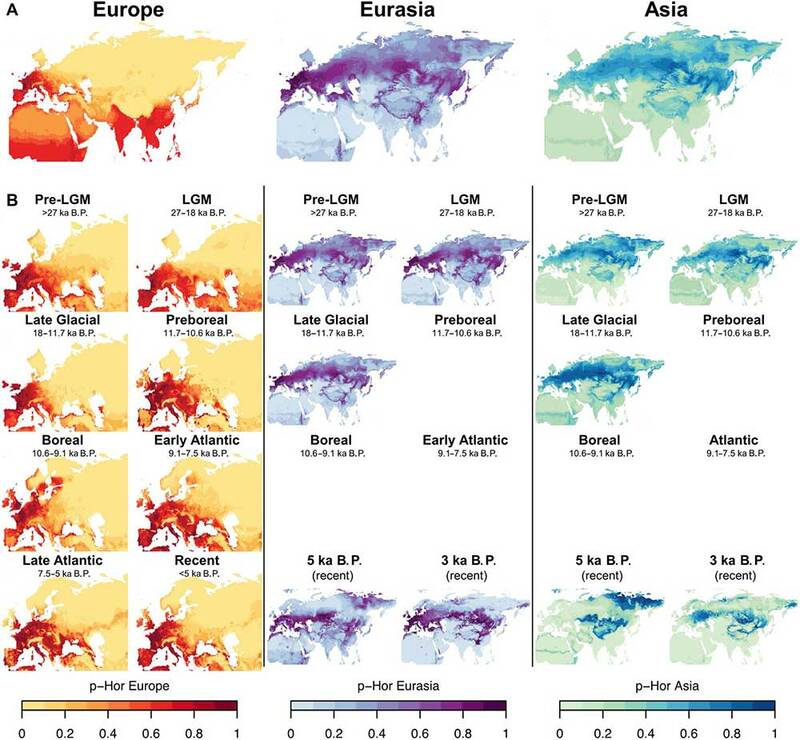 (B) Projection of climatic suitability across Eurasia in different climatic periods based on occurrences in Europe (left), Eurasia (middle), and Asia (right). 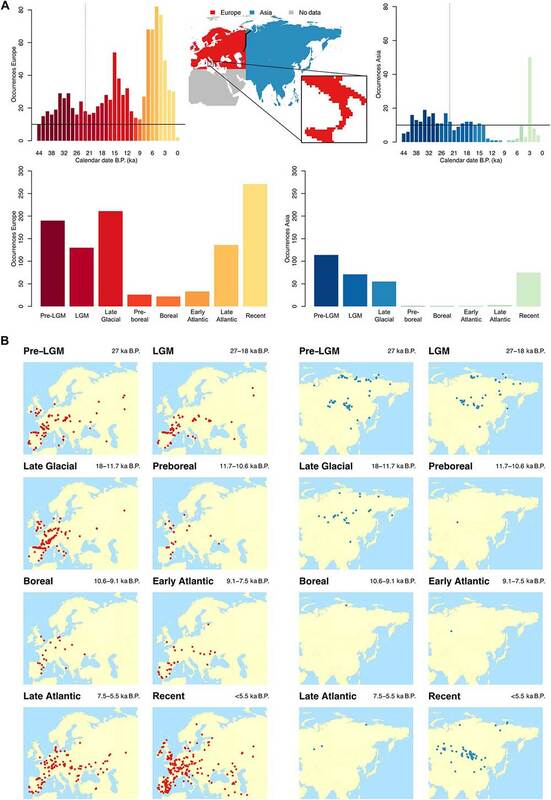 Because of the scarcity of data available for Asia, no models for the Holocene have been possible for both Asia and Eurasia, with the exception of 5 and 3 ka B.P. (both included in the “Recent” period). The decrease of horse remains in Europe is not characterized by a geographic reduction in the overall extent of the area occupied by the species but in a drop of frequencies in a geographic extent that does not vary much between the Late Glacial and the Early Atlantic (Figs. 1B and 4B). This pattern is more likely to result from habitat fragmentation than from a geographic shift in the climatic range suitable for the species, as observed for many animals during the LGM (23). In the whole period ranging from the Preboreal (11.7 to 10.6 ka B.P.) to the Late Atlantic (7.5 to 5.5 ka B.P. ), the total amount of land space most and likely suitable to horses is wider than in the Late Glacial, and only between 8 to 7 ka ago the European range appears patchy and fragmented (Fig. 4C). When comparing each of four successive time bins during the Holocene (8, 7, 6, and 5 ka B.P., respectively) (Fig. 4E), the difference in successive p-Hor values in Europe shows that the suitability for the species in Iberia, northeastern France, Italy, the Balkans, and eastern Europe steadily increased, while in Central Europe strong differences can be observed between neighboring regions. Analyses of the European data set and biomefrequency. (A) Distribution through time of the frequency of horse remains in Europe calculated as NISP of horses versus other ungulates. (B) Density of horse remains through time in Europe, calculated as NISP of horses versus other ungulates. The numbers at the bottom of each bar represent the number of observations falling in each class, from 0 to >5%. (C) Climatic suitability for horses in Europe between 10 and 3 ka B.P. (D) Climatic suitability per time period. Percentage of land cells in Europe with a value of suitability for horses (p-Hor) > 0.5 and p-Hor > 0.8. (E) Holocene climatic amelioration. 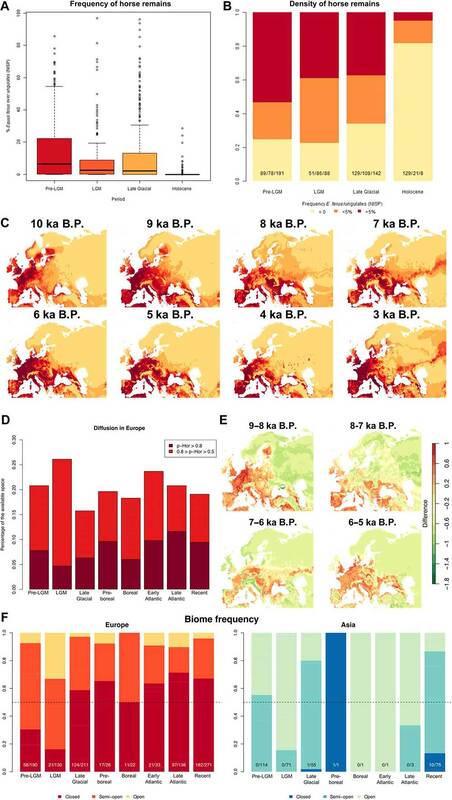 Difference in p-Hor in Europe comparing five successive time bins during the Holocene: 9, 8, 7, 6, and 5 ka B.P. 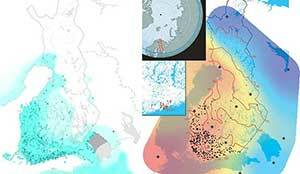 Eachmap shows the difference in themore recent distribution compared to the previous one. (F) Environmental reconstructions in themacro area surrounding horse finds in Europe (left) and Asia (right) per climatic period. The lighter the color, the less forested is the region. The numbers at the bottom of the bars show the number of occurrences in closed environments over all the observations. The dotted line represents a frequency of 0.5. Taken at face value, this pattern would suggest that horses were not restricted to open environments but could equally well inhabit closed, forested environments, as previously suggested (18). However, as others recently emphasized (19), the faunal associations inHolocene sites from Europe suggest a different pattern. The PCAs based on faunal assemblages (figs. S1 and S2) separate on the second principal component sites characterized by ungulates associated to forested areas (red deer, wild boar, and roe deer) and all other animals, associated to semi-open and open environments, including horses for most records. Together, the contrast between the reconstructed microscale and macroscale vegetable coverage in Europe, the increase of horses in mainly forested macroregions, and the spatial pattern of extinction suggest that, from the beginning of the Holocene, the suitable environment became more and more patchy, with open areas increasingly fragmented by forests, where wild populations of horses could have survived in isolation until one or several waves of arrivals of domestic horses, leading to either local admixture or a full replacement of the preexisting local populations. Our data show that, up to 5.5 ka ago, horse finds do not show association with species characteristic of forested areas such as wild boar and roe deer. We infer that the open and semi-open habitats occupied by horses on a narrow geographic scale appear less and less frequent at a macroenvironmental scale, supporting the possibility of increasing fragmentation of open habitats. This event is also likely to have led to an intensification of genetic isolation for the remaining horse populations, a pattern that still needs to be tested on genomic data. The suitability of both Iberia and eastern Europe appears constant throughout the entire post-LGM period, in line with these regions being hotspots of genetic diversity and, possibly, the refugia sources for the recolonization of the continent (11). While the Pontic-Caspian region appears not suitable for European horses around the time when horses where first domesticated some 5.5 ka ago (6), part of this region appears suitable for the Asian horses (with the Caspian Sea as the westernmost boundary). 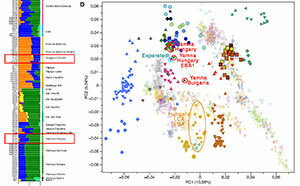 This may suggest that horse domestication started from a population background related to an Asian ancestry and that the further spread of the domesticated horses in Europe involved either adaptation to novel niches (possibly through selective breeding) or the application of domestication techniques to local horse populations pre-adapted to these environmental conditions. Testing this scenario will require mapping the genetic structure of the Eurasian horse population within the fifth to third millennium BCE. 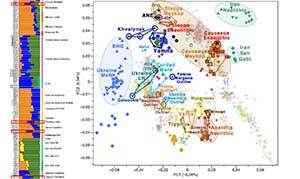 Cultural-anthropological research and archaeological remains (see here), genetics (see here and here), and now also thorough palaeoclimatic and archaeological models point to the North Caspian region, settled by the Khvalynsk culture, as the most likely earliest origin of horse domestication. The paper also supports the favorable conditions of western Europe up to Iberia for the introduction of a horse-riding culture. 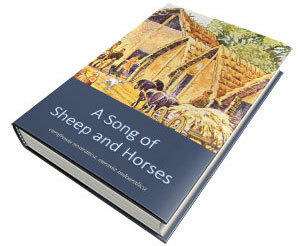 I intended to write a post about the myth of Corded Ware horse riders, but for the moment I haven’t found the time. 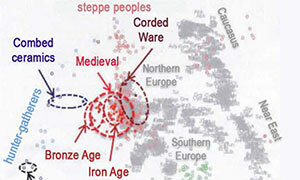 Not that Corded Ware pastoralists didn’t have horses, or could not ride them: they were a highly mobile culture of pastoralists stemming from eastern Poland / western Ukraine, so they must have known horses, like many other European cultures of the late 4th / early 3rd millennium influenced by expanding Yamna settlers. But it just cannot be said to have formed an essential part of their culture, as it was for Khvalynsk-Novodanilovka, and especially Yamna and later East Bell Beaker, Sintashta, etc. 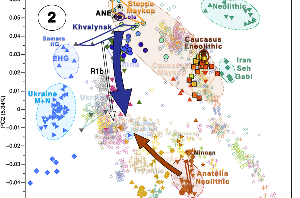 A mere look at these maps suffices to assess the limited role of the horse in north-eastern Europe, the only region where groups of late Corded Ware-derived cultures survived the expansion of Yamna, and especially East Bell Beakers after ca. 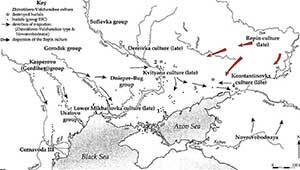 2500 BC, which transformed Western, Northern, and Central Europe, and even East Europe reaching the modern Baltic countries, Belarus, and Romania. Even Trzciniec was born out of the influence from expanding Bell Beakers into earlier Corded Ware territory, although the later (Iron Age) relevance of this culture was probably quite limited. In the upcoming months we will see R1a-fans associating Proto-Indo-Europeans more and more with wool, and sheep, and corded ware, and forest regions, until the proposed homeland shifts to the Baltic and Finland, instead of dat boring horse-riding people of the steppes…No wait, it’s already happening. NOTE. Also open access is the recent Horse Y chromosome assembly displays unique evolutionary features and putative stallion fertility genes, by Janečka et al. Nature Communications (2018).